Using advanced design and superior materials, our windows produce outstanding energy savings and trouble-free operation. 1. The narrowline frame and sash create a clean-line, contemporary appearance with an expanded glass area. At the same time, internal chambers increase structural integrity, rigidity and energy efﬁciency. 2. This innovative composite reinforcement allows for secure mounting of hardware and the non-conductive material helps reduce the transfer of energy. 3. Increased strength and protection is achieved with the end-of-throw cam shift locking action. The low-proﬁle design includes a “locked” indicator that tells you if your windows are left unlocked. 4. Smooth and uniform, the true sloped sill quickly directs water runoff without the use of weep holes, keeping the exterior of the window clean and attractive. Our telescoping sill dam delivers a triple payoff: protection from air and water inﬁltration, increased structural stability and enhanced beauty. 5. When extreme wind and weather hit, the sash-to-sill interlock stands strong. Traditional sloped sill designs can allow the sash to bow during powerful winds, but with our interlocking technology, the sash is channeled ﬁrmly into the window frame for a uniﬁed wall of strength. The compression bulb seal creates a snug ﬁt that eliminates light penetration between the screen and frame. It also aids in easy screen installation and removal. Create custom appeal with our luxurious color collection. Exterior colors feature a cutting-edge polyurethane coating technology with heat-reﬂective pigments for a remarkably strong and fade-resistant ﬁnish. Interior woodgrain laminates are performance-engineered for superb durability that maintains its attractive appearance over the life of the product. 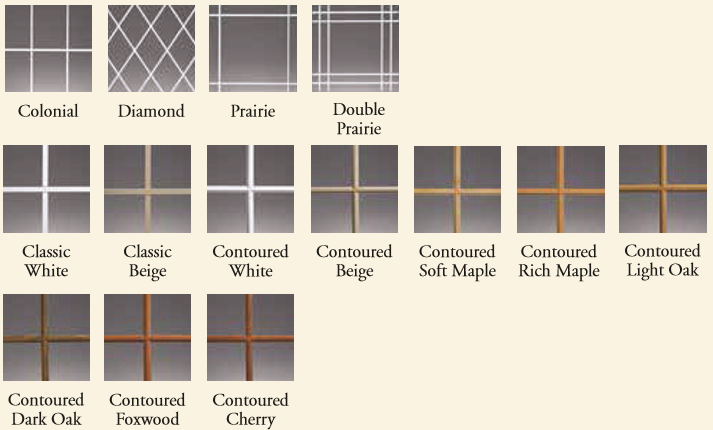 Classic grids are available in complementary White or Beige, with colonial, diamond, prairie and double prairie patterns. Contoured colonial grids feature a modeled “cut wood” look and are available in complementary colors and in matching woodgrains. A beautiful cut glass pattern will lend a touch of elegance without obstructing the view.